Solomon Islands are ready to represent Oceania at the Youth Olympic Games in Buenos Aires, Argentina this month. The junior Kurukuru earned the right to participate in Buenos Aires after winning the inaugural OFC Youth Futsal tournament in Auckland last year. Featuring an array of talented young futsal players, the Solomon Islands will be in for a tough challenge against some of the top notch futsal nations on the world stage. They are pooled in Group B which includes Brazil, Iran, Russia and Costa Rica where futsal as a sport is set take centre stage at the Youth Olympics. For most of the players it’s a new experience for them but their coach knows what it’s like to play at international level. Solomon Islands coach Stanley Puairana was a member of the Solomon Islands national futsal team that went to their debut FIFA Futsal World Cup 2008 in Brazil. “I know from personal experience it will be tough for our boys but we are heading into the competition to compete”, the former Solomon Islands international said. “We are representing Oceania as champions of our region which is a bonus for us. Puairana said the team have been preparing for the Youth Olympics since November last year. “So far so good for us as a team because we have been working very hard in preparation for the Youth Olympics”, Puairana said. “I am very happy with how the boys reacted in training and we are now focusing on the tournament which starts this weekend. The Solomon Islands youth team participated in the SIPA National Futsal League as part of their preparation. “We learned a lot in the national league as the boys played against senior teams. “Despite missing our target to win the league our boys had improved their defense and playing as a team in offense. “Finishing second in the league was an encouraging sign for us and these young boys will take so much confidence from it”, Puairana said. 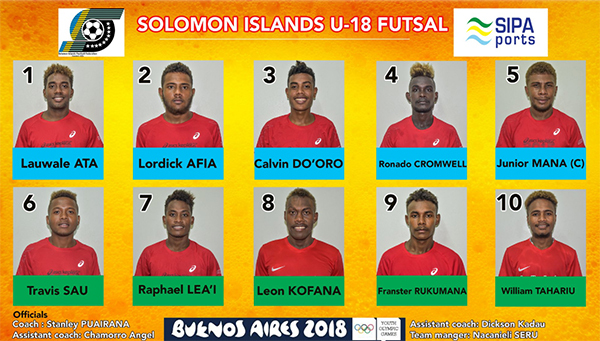 Golden boy Raphael Lea’i , who picked up both the Golden Ball and Boot at the recent OFC U-16 Championship, will be key to the Solomon Islands campaign in Argentina but Puairana is adamant there are other players who will have an impact too. “Rafa is the star player in the team but there are other players like Calwin Do’oro, Lordick Afia and Franster Rukumana who could shine in Argentina”, Puairana highlighted.